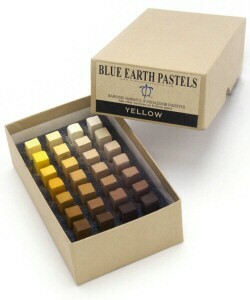 Blue Earth Pastels are made in the town of Blue Earth, Minnesota, USA by artists Jim and Ross Pollard in a restored 1890s building. The pastels are organised by hue, value and intensity. This traditional approach to organising colour is intuitive and makes finding the right colour very easy. The pastels are very soft and have a rectangle shape allowing work to be completed with an edge or as you would with a round pastel. The pastels are shorter than the traditional round pastels but are chunkier and have excellent covering power. The sets come in an innovative foam pallet which allows you to peel back a layer of foam to expose the pastels for working. These pastels are sure to become a favourite of many of us.